Our national Do Not Knock campaign kicked off only a few days ago, but look how many self-addressed stamped envelopes we’ve already received from people seeking stickers! 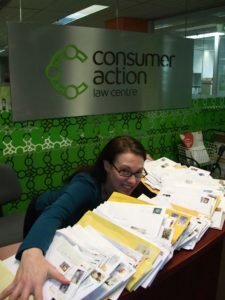 Here’s Consumer Action’s office manager Skye surveying the hundreds of envelopes received so far. We’ll be posting out the stickers as soon as we can. Thanks to Victoria Legal Aid, we are now able to send stickers out without the need for the self-addressed stamped envelope. Simply send your details via the online form on the Get the Sticker page.